Travel to Cornwall how to get to Cornwall, bus, train, car or plane? Travelling to Cornwall, how to get here. Travelling to Cornwall by Car By far the majority of you will travel to Cornwall by car. The United Kingdom has an extensive Motorway Network. The M4 connects London with Wales and the West Country joining the M5 from Birmingham (M6) and the north of England with Exeter in Devon where the A30 dual carriageway takes you the rest of the way to Cornwall. Works were completed in July 2017 to remove a infamous length of single carriageway and long standing bottleneck on the A30 at Temple- a uninterrupted length of dual carriageway now extends 42 miles into the county as far west as Carland Cross. Beyond Temple you can then join the A392 to reach Newquay. The traffic option on Google Maps provides a near realtime indication of traffic delays. Over the last few years much of the remainder of the A30 has been improved providing a faster route to Penzance and the far west of the County. From London to Newquay (M4,M5,A30,A392) is some 230 miles allow a minimum of 5 hours by car in light traffic. From Birmingham to Launceston (M6,M5,A30) on the county border is some 200 mile allow 4 and a half hours by car, again in light traffic. Want to hire a car when you arrive in Cornwall? Hertz have a rental outlet in Truro and will deliver to your door. It's possible to hire a car locally even in towns as small as Launceston. Travel Tips. During the season the M5, A30 and A38- the main routes leading into Cornwall, get very busy, particularly on a Saturday morning. Once into Cornwall tailbacks occur at Carland Cross, and Blackwater eastbound on a Friday and Saturday, with westbound tailbacks on a Saturday. Some accommodation providers have Friday changeovers. Many more people are now staggering their journey and so try to avoid any likely holdups. Why don't you do the same? Remember tiredness kills so take a break every few hours. Pull off the road, stop the car, and take a walk for half an hour or so until you feel refreshed. Travel in Cornwall- many of the lanes are narrow and have high hedges. Do expect to have to reverse to let oncoming vehicles pass. Why not do as the locals do and raise your hand with a friendly wave, as an acknowledgement if someone lets you through? Remember narrow usually quiet roads are part of the unspoilt charm of Beautiful Cornwall. Drive with care, and have a great holiday. Travelling to Cornwall by Train? 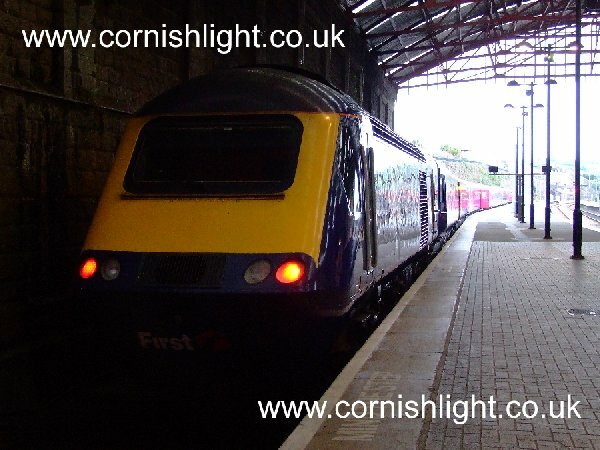 fast Intercity Express's arrive in Penzance from London (Paddington) and Birmingham (New Street) several times daily. These stop at Plymouth, Liskeard, St Austell, Truro, Camborne, St Erth for St Ives. Allow 5 to 6 hours. There are even daily through trains from Scotland. There are frequent London to Cornwall trains from Heathrow or Gatwick Airport, though you either have to catch the Heathrow Express to Paddington or connection services with mainline trains at at Reading. See www.nationalrail.co.uk for national timetables and to buy tickets online, and First Great Western . Travel to Cornwall By Coach? Travelling to Cornwall by Coach National Express run daily from Penzance and Truro to London. Victoria for the Tube, Heathrow and Gatwick Airport, the Channel Tunnel and Europe. Allow 8 hours from Penzance to London Victoria. See National Express's www.nationalexpress.co.uk web site for times and fares. Once you get to Cornwall there are local coach services to towns such as St Ives, Falmouth, even a coach from Exeter in Devon to Boscastle and Tintagel. See this excellent easy to use Cornwall Public Transport for full timetable information on all bus services operating in Cornwall, as well as information on rail, coach, air and ferry services. The site even includes town and county bus and coach route maps. Starting in the West of the county- there are frequent services from St Ives to Penzance, from St Ives to Lands End. From Falmouth to Newquay via Truro, from Truro to Redruth. from St Austell to Mevagissey. In the east of the County- from Looe to Plymouth, and from Looe to Liskeard. Places such as St Ives and Fowey, and Truro all have town services. It must however be said it is not that easy to travel to the less populated and more rural parts of this lovely County, (as any other in the UK) by means of public transport. Ryanair fly daily to London Stanstead from Cornwall Newquay (flights take less than an hour). Flights from London to Cornwall. Easyjet intend to offer flights from Liverpool (just over an hour duration) to Newquay during the summer. Skybus in addition to flights to Scilly from Penzance, Lands End, Bristol, Southampton, and Exeter, run flights from Bristol and Southampton to Newquay.